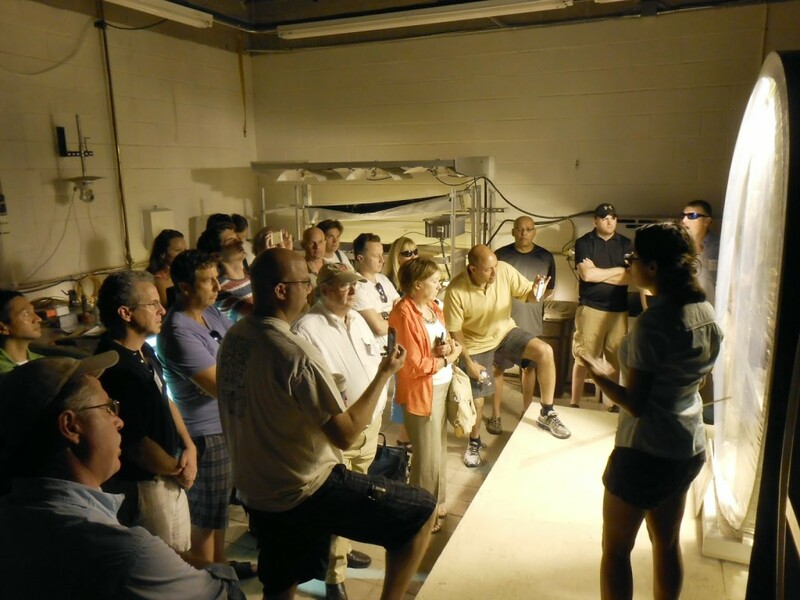 March 22–27, 2015, will be held at the Westward Look Resort in Tucson, Ariz.
of hands-on workshops at the CEAC campus. 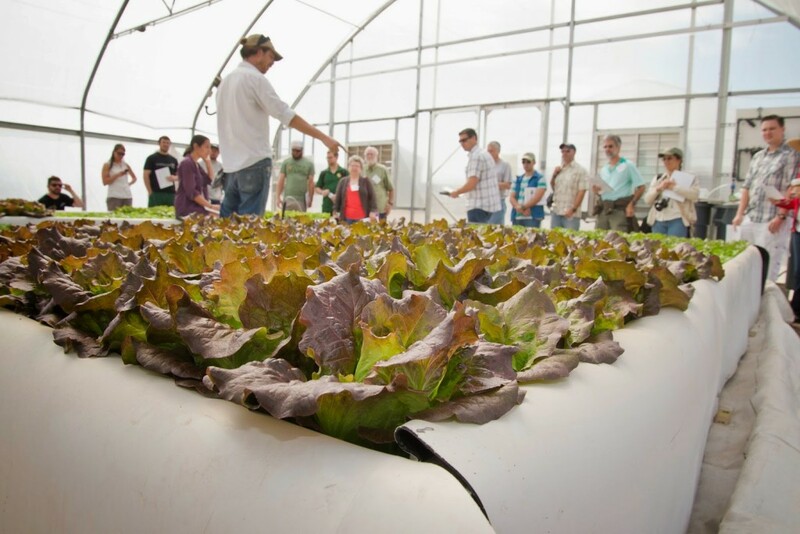 & Engineering Design Short Course, March 22–27, 2015.
aquaponics, lighting, fertilization, integrated pest management and food safety. researchers, and other industry professionals. environment crops as well as how to finance and market their businesses. enough to the people who are interested in investing in the industry. 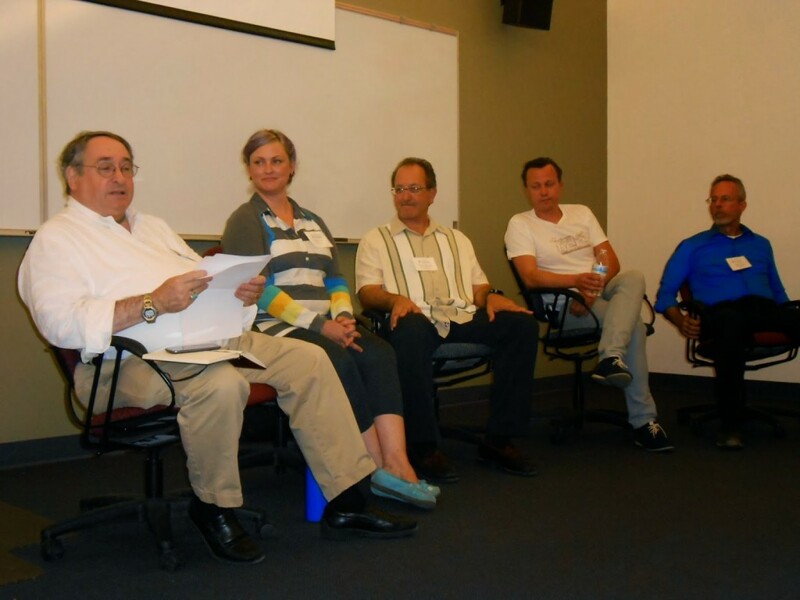 which was held in Tucson in July. want to invest in a successful business. facility and a small grow box for greens. transitioned to the business side. and a small grow box for greens from Japan. as well as growing inside using only electrical lamps,” Giacomelli said. buyer for a national grocery store chain and a philanthropist investor. 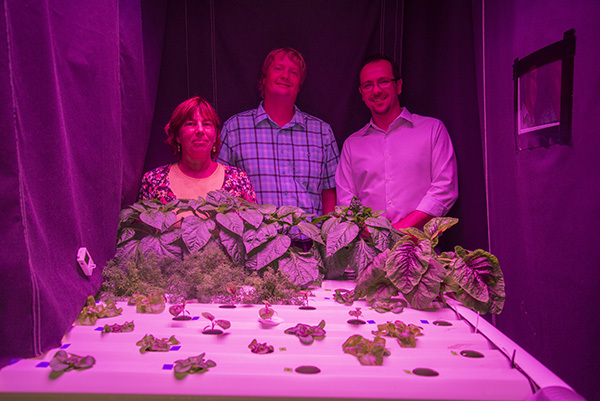 grower, Specialty Greens could get two, possibly three harvests out in 30 days. Experiment information provided by Patty Phaneuf from Specialty Greens, and Posted by Maria Luitjohan from Hort Americas. day cycle from seed to harvest. cloner) achieve this goal or are three necessary? nutrient will be applied at the dilution described above. 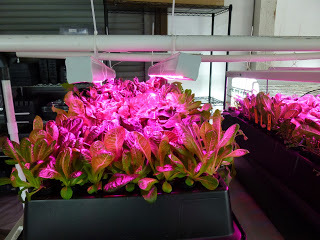 Specialty Greens is providing growers interested in hydroponics all the they need to grow hydroponically in a 2 ft sq. space! Researchers at the University of Kentucky are using a greenhouse and LED lights to study the feasibility of growing algae with flue gas from coal-burning power plants to reduce greenhouse gas emissions. Algae are considered a nuisance by commercial greenhouse growers. The warm, moist conditions that occur in greenhouses provide the ideal environment for algae growth. Algae can be found anywhere these conditions exist, including floors, walkways, under and on benches, on greenhouse glazings and walls, in irrigation pipes and emitters and misting lines, on the surface of evaporative cooling pads and on the surface of growing media in containers and ground beds. Algae can also be a food source for fungus gnats and shore flies. But algae also hold great potential in the production of value-added products. Even though algae are a problem for growers, these simple green plants hold great potential in the production of biofuels, fertilizers, cosmetics, fish and animal feed and other value-added products. Members of the algae program at the University of Kentucky in Lexington are looking at the potential of algae production to help lower the emission of greenhouse gases, primarily carbon dioxide, from the burning of fossil fuels, particularly coal. 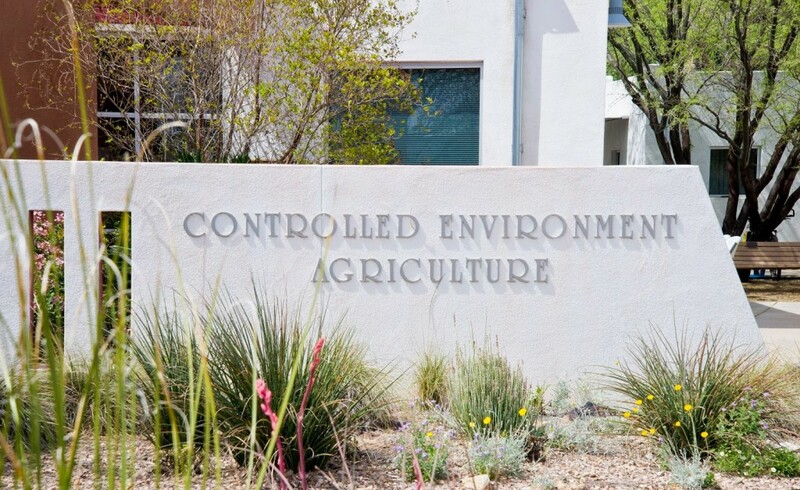 Andy Placido, an engineer associate with the university’s Center for Applied Energy Research, said the restrictions on greenhouse gas emissions will only increase as environmental issues gain in importance among the public and government and regulatory officials. production under higher light levels and warmer temperatures. While most coal-burning power plants in Kentucky have been equipped with scrubbers to remove sulfur dioxide and nitrogen oxides, Placido said little has been done to restrict the amount of carbon dioxide that is generated in the flue gas. If the research is successful in capturing and using the carbon dioxide, there is the potential to use some of the sulfur and nitrogen currently being removed from the flue gas by the scrubbers. 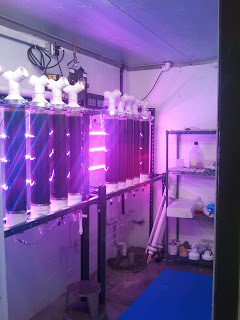 Placido said the algae culturing system starts in the laboratory where the algae are allowed to multiply. Placido said this is when he and the other researchers start to work with the algae in an in-house designed culture closet equipped with Philips LED lights. 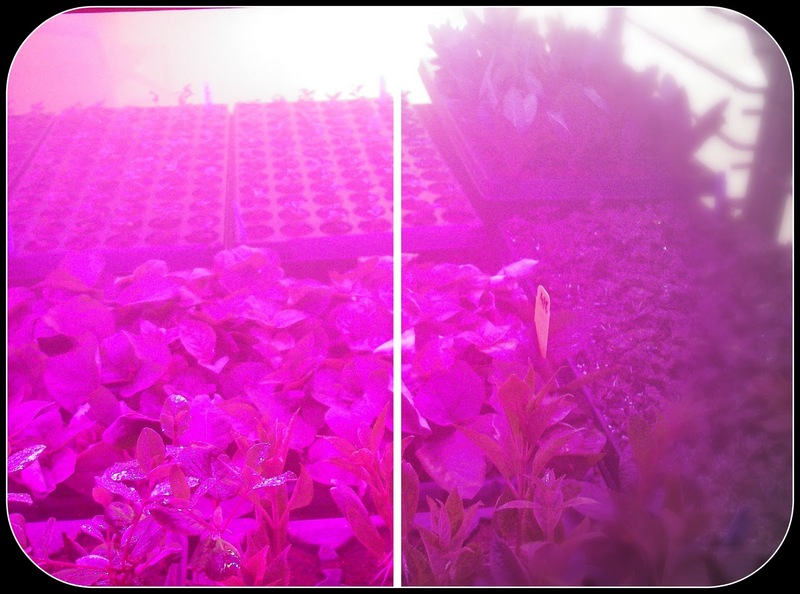 LED lights are being used 24 hours a day in the culture room to provide constant light. Placido said they are also looking at using the LEDs outside as a supplement at night and possibly during winter at the power plant so the algae continue to grow. Placido said algae split when they grow so production is judged on doubling time. Under optimum light and temperatures in the lab a doubling time of 12-24 hours is achievable. Placido said algae growth is much better with the LEDs in a controlled environment than outside under natural conditions. He said the difference in growth comparing inside and outdoor conditions has not been quantified. “We have gotten much greater algae growth rates inside in the culture closet equipped with LEDs than outside or in the greenhouse even under the best days in regards to light and temperature,” he said. Algae is produced in photo-reactors that can be placed inside or outside of a greenhouse. that will use the carbon dioxide given off in the plant’s flue gas. Placido said when the system is set up at the power plant, more flue gas will be produced than can be used to grow the algae. The flue gas will be pulled into the photo-reactor, which is a series of glass tubes on a steel frame, as carbon dioxide gas is needed. “Once the system is saturated with carbon dioxide, the algae will be allowed to grow and then will be harvested. More carbon dioxide will be added as it is needed,” he said. “We know that our reactor isn’t nearly big enough to capture all of the carbon dioxide. The reactor we are using only holds about 2,000 gallons of water. That’s a good size, but nowhere near the size we would need to capture all of the carbon dioxide. We have estimated to capture all of the carbon dioxide from this one power plant would require a reactor that would cover 100 acres and take millions of gallons of water. Placido said the power plant can provide an unlimited amount of steam to keep the water in the reactor tubes from freezing during the winter. Placido said there are some possibilities for commercial growers to produce algae and use algae in the future. For more: Andy Placido is Engineer Associate II, University of Kentucky, Center for Applied Energy Research, (859) 257-0223; andy.placido@uky.edu. David Kuack is a freelance technical writer in Fort Worth, Texas, dkuack@gmail.com. Hort Americas has been extremely busy leading up to the Thanksgiving Holiday Weekend. And lets just say its the good busy, the fun busy! Last night we shot our first video which will ultimately become a series of educational and information videos geared towards the commercial horticulture and hydroponic industry. The first video will focus in on the Philips GreenPower LED Production Module and its possible application in the production of ornamental and hydroponic crops. 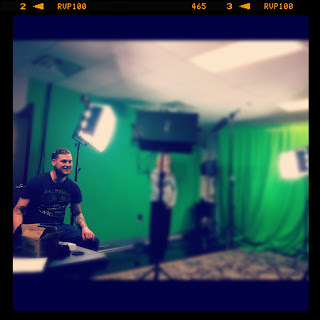 The New Videos will focus on LED Grow Lights and will star Ms. Abigail Herring! Hort Americas is also and excited and proud to be working with many of the industry’s top editors. We are dedicated and focused on helping to build the industry, which makes us thankful (since it is Thanksgiving) for the work of individuals like Annie White of Ball Publishing. See a sample of Annie’s work here. when Jean-Marc Versolato at Bailey Nurseries in St.
using LED lights to root cuttings it piqued his interest. 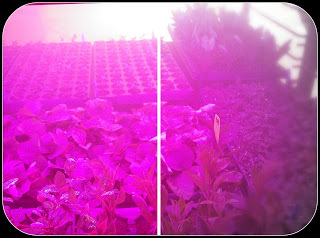 greenhouses to trial the LED lights. located about 16 inches away from the cuttings. genus for a total of 15 flats. caused the fog to descend on the cuttings and the fog kept the cuttings turgid. 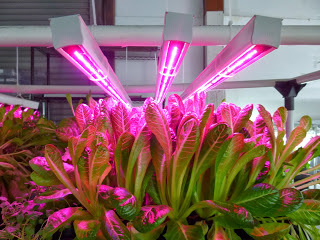 LED lights generate heat, but nothing like other lights available for growing. vulagris) cuttings in the propagation room. a sample of each one of them under the LED lights to see how they perform. 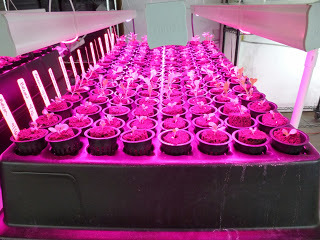 the lilac trial, 15 flats of cuttings were lit by five modules of LED lights. handling carts a lot faster and easier. or speed up time to flower. screwed into regular light fixtures. One helps to promote flowering. days of the year and the plants are very slow to develop buds. 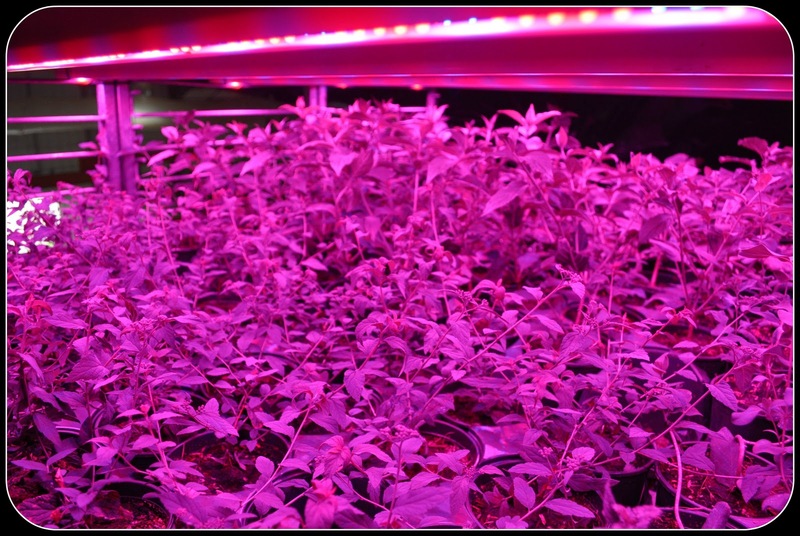 Versolato wants to see what impact the addition of LED lights will have on the plants. bud count,” he said. “The crop would be put out in the greenhouses around Feb.
David Kuack is a freelance technical writer in Fort Worth, Texas; dkuack@gmail.com. Jean-Marc Versolato is IPM manager, Bailey Nurseries in St. Paul, Minn.